Greyhound Inn & Hotel01291 672505work01291 673447fax HotelThe Greyhound Inn and Hotel offers everything you would expect from the best of country inns. We are a traditional, 18th century stone-built village pub with accommodation near the picturesque small town of Usk, in the heart of rural Monmouthshire, South Wales. Whether you come to stay, to eat a meal or a bar snack, or just pop in for a drink, you are always assured of the warmest of welcomes. Kelly and Steve Jolliffe and their team are proud of the great reputation they have for their delicious, home-cooked food, and for the relaxed, friendly atmosphere. The roaring log fires and cosy bars will cheer up the worst of winter weather while the beautiful gardens with their glorious summertime floral displays are perfect for enjoying a drink or something to eat on warmer days and evenings. We have 10 attractively-furnished bedrooms, all of which are dog friendly and all with en-suite bath and shower, in a stone-built, two-storey, 17th century stable block next to the main building. Ground floor rooms open on to the garden terrace. Free wi-fi and flat screen TVs in all the rooms. All in all, its this winning combination that has earned The Greyhound the title of a Visit Wales Four Star inn, as well as a host of other awards over the years. Come and experience it for yourself! With its attractive rural setting, The Greyhound is ideally located as your gateway to Wales, within easy reach of the M4, M50, M5 and only 2 hours travel time from London and Birmingham. So many fascinating places are on our doorstep. The lovely market towns of Usk, Chepstow, Abergavenny and Monmouth, Raglan Castle, Tintern Abbey, Caerleon Roman Baths and Amphitheatre and Wales' capital city of Cardiff. The beautiful Usk and Wye Valleys, Brecon Beacons, Black Mountains and close by Wentwood Forest are a must to explore. The grid shows the prices and daily availability from Thu 18 Apr 19 to Mon 29 Apr 19. It's easy to check availability for particular dates; just use the calendar to choose the check in date, select the number of nights and click the 'Search' button.. 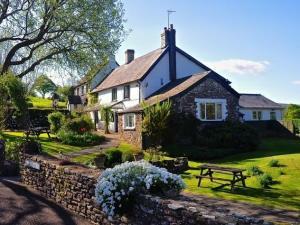 The Greyhound Inn and Hotel offers everything you would expect from the best of country inns. We are a traditional, 18th century stone-built village pub with accommodation near the picturesque small town of Usk, in the heart of rural Monmouthshire, South Wales. Whether you come to stay, to eat a meal or a bar snack, or just pop in for a drink, you are always assured of the warmest of welcomes. Dogs are allowed in our top stable bar and we have plenty of outside seating in our lovely garden. There is an additional charge of £15.00 per night night for a dog. We provide dog bedding, water bowls, dog poop bags and treats upon check in. Dog walks leaflet also available on check in. The accommodation block is situated adjacent to our lovely garden. Children welcome from any age. Cross the Severn Bridge (A48) or the second Severn Crossing (M4) heading west towards Newport. Take junction 24 off the M4 onto the A449 signposted Monmouth and exit at the first junction signposted Usk. On entering the town of Usk, turn left into Twyn Square (Clock Tower) and follow the road signposted Llantrisant. Follow the road for 3 miles around several bends, under the A449 bridge and the Greyhound Inn is on the right hand side. If arriving in South Wales by train, the nearest station is Newport. From here, there is a regular bus service to either Usk or Llantrisant which takes around half an hour.